Mass protests against Donald Trump and his immigration policies were held across the US on Saturday, in cities from Los Angeles to Boston and in state capitals and smaller towns between. 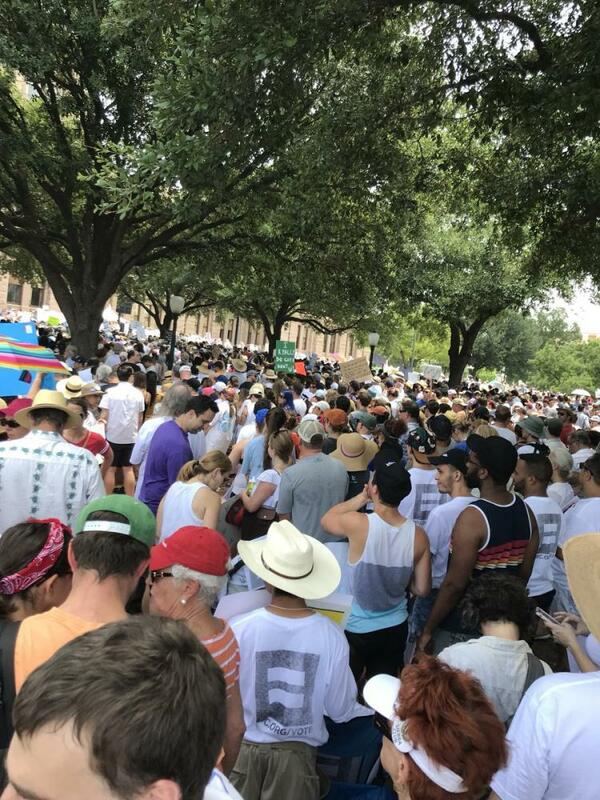 As large parts of the country sweltered beneath a heatwave, marchers braved the blistering sun to express fierce opposition to the president’s policy of separating undocumented immigrant families at the southern border. They also voiced concern over Trump’s forthcoming supreme court pick. The president, who was playing golf at his club in New Jersey, attacked what he called “radical left” Democrats, who he said were behind calls to disband Immigration and Customs Enforcement (Ice), the agency central to his hardline immigration approach. Immigration policy is a central pillar of Trump’s appeal to his supporters ahead of November’s midterm elections. It is also key to motivating opposition to the president, particularly among the surging progressive wing of the Democratic party.. 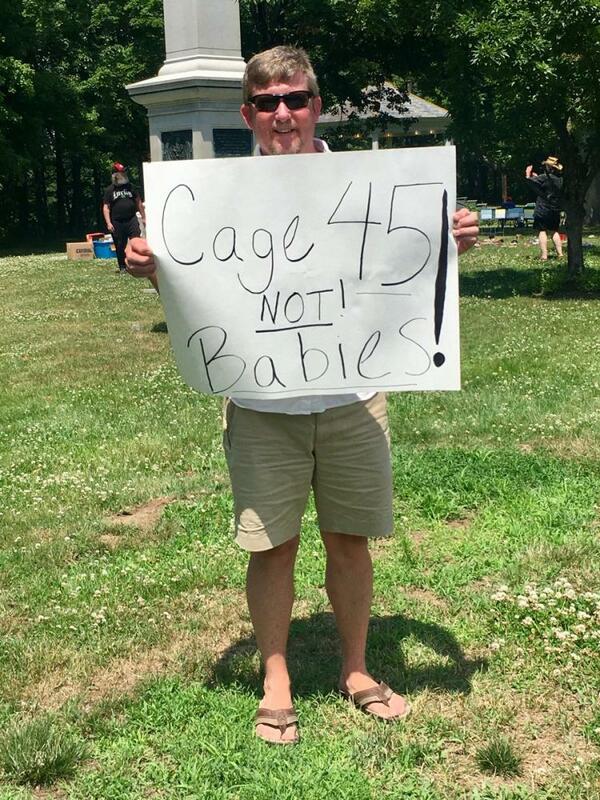 In Washington on Saturday, protesters gathered in Lafayette Square, close to the White House. Organised by MoveOn, the American Civil Liberties Union and dozens of other groups, the Families Belong Together march featured star speakers Lin-Manuel Miranda, Alicia Keys and America Ferrera. Miranda sang a lullaby, Dear Theodosia, from his hit musical Hamilton. Like many present, Holland attended the Women’s March on the National Mall in January 2017. The capital has turned into a site of major protest, including the March for Science last year and more recently a student-led gun control effort, the March for Our Lives. On Saturday New York also saw a major rally, as did Los Angeles, Dallas, Denver, Chicago, Boston and other big cities. Senior Democratic figures addressed crowds; in Boston, speakers included the possible 2020 presidential candidate Senator Elizabeth Warren and the congressman Joe Kennedy III. In LA, Senator Kamala Harris, another potential 2020 pick, spoke after John Legend performed. Smaller protests were staged at federal facilities in Texas and outside Trump’s New Jersey club, where around 200 people gathered. Trump was expected to begin interviewing candidates to replace Anthony Kennedy, the supreme court justice who announced his retirement this week. The protests were also focusing on that choice, which is expected to turn the court sharply right, placing in jeopardy rulings such as Roe v Wade, the 1973 opinion which guarantees the right to abortion. This week, the court upheld Trump’s travel ban against Muslim-majority countries and dealt a heavy blow to unionised labour. This month, Trump stopped the separations policy, after intense public outcry over images and recordings of children held in cages at federal facilities. But his order was unclear and the administration has been criticised for the lack of a plan to reunite around 2,000 children with their parents. The administration is now claiming the right to detain families indefinitely, ignoring a 1997 court settlement that limits how long children can be held. In Indianapolis, thousands gathered outside the seat of government in the home state of Vice-President Mike Pence. As people cheered, Mahri Irvine, a 35-year-old anthropologist, spoke to the Guardian by phone. Trump’s reference to “radical left Dems” may have been inspired by the surprise victory in a New York Democratic primary this week of young activist Alexandria Ocasio-Cortez. The 28-year-old, who shocked party stalwart Joe Crowley, describes herself as a democratic socialist and campaigned on a platform that included the abolition of Ice. Pressure on Ice has also come from within. Nineteen senior agents sent an open letter to Kirstjen Nielsen, Trump’s homeland security secretary, saying it should be disbanded. The investigators said the immigration crackdown was interfering with the agency’s work against transnational criminal groups.